Design and establish astonishing views with the elegant and decorative Botanic Window Die. This intricate three-piece die allows you to cut several versions of beautiful antiquated fenestella outlines suitable to use as single decorative die cuts on their own, or to mix and match together to create even more stunning showpieces. Simply die cut, assemble as desired and create your very own garden view on cards, layouts and mixed media projects! These dies are part of the Botanic Orchid Collection. Approximate Image Sizes: 1. 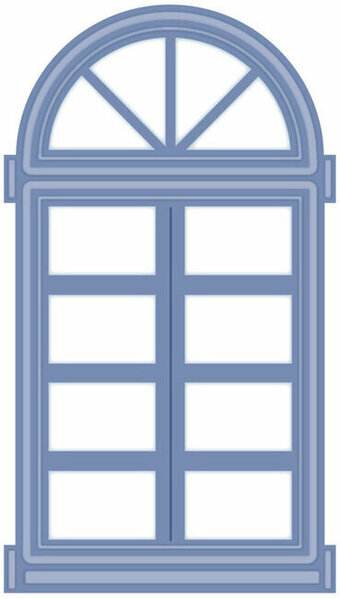 Large Decorative Window: 5.5" x 4.0", 2. Center Window Cut: 4.5" x 2.5", 3. Decorative Window Center: 4.25" x 2.25". 10 Arched Windows nested craft dies from Hunkydory Crafts. Poppystamps craft die featuring 3 windows. 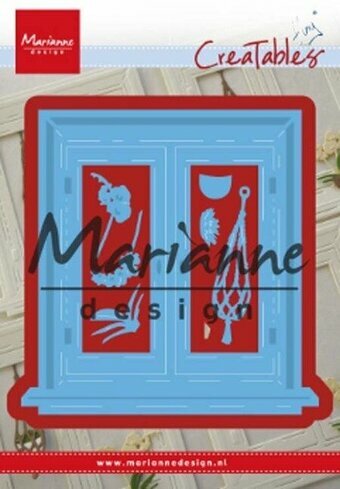 Christmas themed craft dies featuring a Window With Shutters. 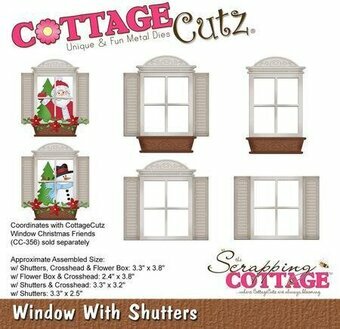 CottageCutz are thin metal dies. They are easy-to-use and add great detail to any craft project. 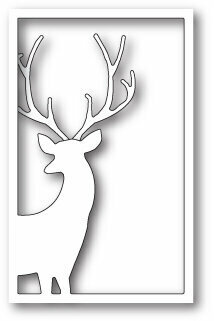 Craft die from Memory Box featuring a reindeer looking through a frame. 2.3 x 3.8 inches window, 1.8 x 1.6 inches antler; 5.8 x 9.7 centimeters window, 4.6 x 4.1 centimeters antler. If you love inlay work, you will love this series of stained glass inspired dies. But there are also dozens of other techniques to use to create the lovely stained glass effect. Cut the die with black or pewter colored cardstock and glue it to acetate. Color the acetate with Copic markers to create the glass look. Another idea is to use different colors of glitter in the spaces. The Iris Stained Glass measures 2" x 4". Memory Box/Poppy Stamps craft dies are made of 100% steel. For use on cardstock, felt, and fabric. Cut, stencil, emboss, create! Use in most leading die cut systems. 2.4" x 3.25". This window design is unique. It has cuts to open both window panes and slit lines to tuck in flowers to become a flower box. Such a clever design! Spellbinders Shapeabilities Die D-Lites cut, emboss and stencil with a single die template. 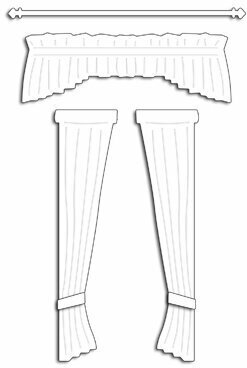 Approximate Die Template Size: 2 1/2" x 3 5/8". Memory Box/Poppy Stamps craft dies are made of 100% steel. For use on cardstock, felt, and fabric. Cut, stencil, emboss, create! Use in most leading die cut systems. 3.25" x 4.25". Beautiful window die. Use with decoupage sheets to create views. 7 pcs, 3.8 x 3.9 inches. The door measures 7/8" x 2-1/8" and the window measures 3/4" x 7/8". This die is compatible with most tabletop die cut machines. Additional shims may be necessary and some machines handle the detail level better than others. Memory Box/Poppy Stamps craft dies are made of 100% steel. For use on cardstock, felt, and fabric. Cut, stencil, emboss, create! Use in most leading die cut systems. 1" x 3.6". Love themed Impression Obsession craft die featuring a heart window. This is a set of two dies. The heart cutout measures 2-1/2 x 2-1/2 and the rays measure out to 3-3/4 x 4. The word dies measures 2 x 2 inches. Memory Box/Poppy Stamps craft dies are made of 100% steel. For use on cardstock, felt, and fabric. Cut, stencil, emboss, create! Use in most leading die cut systems. 1.1 x 1.4 inches cut out, 1.3 x 0.2 inch each ledge. The Rectangle Shaker Window & Frame Die-namics includes a rectangle die designed to create perfectly-sized holes in your card fronts and panels to accommodate our Rectangle Shaker Pouches. The 3/8" frame element will layer over the pouch to conceal the pouch edge and create a beautifully seamless look. This 2 piece set includes: Window 1 3/4" x 2 1/4", Frame 2 1/8" x 2 5/8". MFT Die-namics dies are our very own EXCLUSIVE, American made line of steel dies. Magical winter or holiday themed window scenes are quick and easy to recreate with the delightful Window Frame Die! Add a touch of nostalgia to an outdoor window display with the addition of an old fashioned sled die cut or opt to design an inviting indoor scene with the illuminated candle. Approximate Image Sizes: 1. Window Frame 1: 4.0" x 3.0", 2. Window Frame 2: 2.5" x 3.5", 3. Window Frame 3: 3.0" x 2.0", 4. Sled: 3.0" x 1.5", 5. Candle: 2.25" x 1.75". Memory Box/Poppy Stamps craft dies are made of 100% steel. For use on cardstock, felt, and fabric. Cut, stencil, emboss, create! Use in most leading die cut systems. 1.6 x 2.4 inches cut out, 1.9 x 0.3 inch each ledge. Memory Box/Poppy Stamps craft dies are made of 100% steel. For use on cardstock, felt, and fabric. Cut, stencil, emboss, create! Use in most leading die cut systems. 1" x 2.6". Penny Black Creative Die featuring Window curtains. We've been wanting to do a window die for a long long time. And it's finally happened. This arched window measures 2.125" x 3" and features hinged sides but an open center so you can make the window actually open. Build a scene behind the window for a creative card that will wow your friends. Add optional shutters (FRA9598) for a country window look. Frantic Stamper Precision Dies work in most standard table-top die cutting machines such as the Big Shot, Vagabond, Cuttlebug, etc. Our dies are made in the USA. 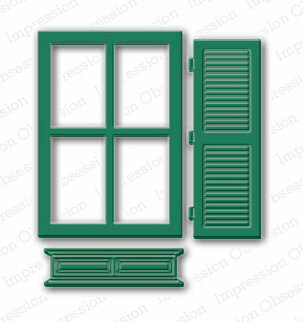 This window die creates a fun aperture or frame for scenes. Great for Christmas, but this die can be used all year long to frame your outdoor scenes. Stitched Collection dies all feature a fun stitched border. The Stitched Collection is a collection of high quality steel dies designed to coordinate with each other. Designed by Lisa Horton. Includes 17 dies. Size: (Largest) 2.8 x 4 in (Smallest) 0.1 x 0.3in. 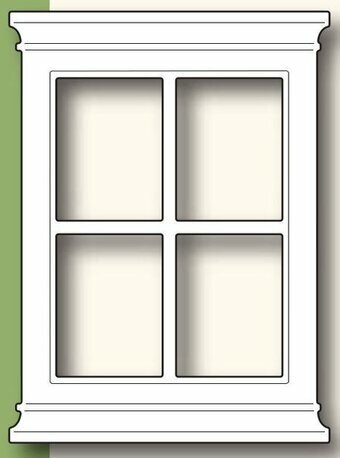 The Peek-a-Boo Circle Windows Die-namics creates holes in two styles in your card fronts and panels leaving a decorative stitched border around the window perimeter. Peek-a-Boo Circle Windows Die-namics coordinates with the Whimsical Wishes stamp set and includes the following elements: Windows (2) measuring 2" with stitch lines at 2 3/8". This set of 2 dies is a remake and upgrade of one of our original and most popular dies (called Triple Square). The original die is made up of 3 squares in a row each measuring 1.25" spaced apart by 1/4". We've added a rounded corner rectangle die measuring 5"x2", thus giving you many options for using them together or alone. Using the original triple square die will cut 3 windows INTO your card. 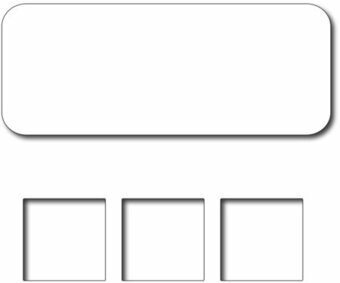 Now, with the added outer frame, you can cut the windows into the larger rectangle instead of your card front, thereby giving you a layer piece. The outer frame is also nice for using with a stamped image. The soft rounded corners are less harsh than a standard square, and the size is a good proportion for framing a phrase or sentiment. As an added bonus, the 1.25" squares of the triple square windows die are the perfect size for our immensly popular vignette dies and stamps, as well as for inchies style stamps. Filled with a wonderful assortment of flower and greenery fillers, the Window Box Fillers Die when paired with the coordinating cling stamp set will allow you to create petite and delicate flowers, foliage and branches perfect for accenting window scenes, flower clusters and have also been perfectly sized to coordinate with the dimensional window box in the Winter's Eve Collection! Approximate Image Sizes: 1. Flowers Pointed Petals: 2.5" x 2.5", 2. Flowers Rounded Petals: 2.25" x 2.0", 3. Foliage with Berries: 2.25" x 1.75", 4. Branch: 2.5" x 2.0", 5. Leafy Branch 1: 2.25" x 2.25", 6. Leafy Branch 2: 2.5" x 1.75". Features large tree framed through a window. This is a single die measuring 3-3/4 x 5 inches. The window is 2" x 2-7/8". These dies are compatible with most tabletop die cut machines.